We all pray for warm weather and when it finally arrives we complain it's too hot. What are we like? Arguably anything over 26 degrees in London becomes slightly unbearable. There is something about living in the city that makes it feel so much hotter than it actually is. Thirty-one degrees feels more like high thirties. It's not a let's lie by the pool kind of ordeal but more of a let me try not to drip with sweat on the central line during rush hour. Nobody likes a sweaty betty at the best of times but trying to stay remotely presentable in this weather is proving rather difficult. Surely I can't be alone? With this in mind, I tend to steer clear of tight clothing not to mention I'm not the biggest fan of anything too fitted anyways. 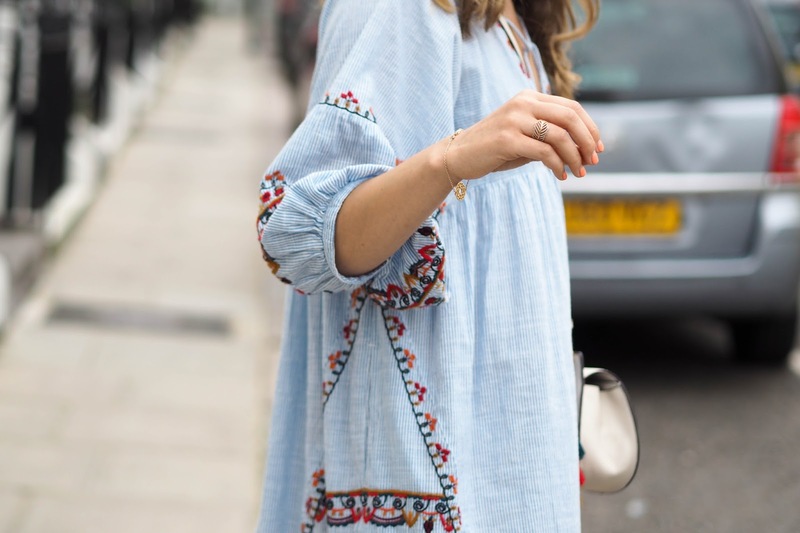 The reason I love smock style dresses for the summer is they keep you cool and generally look pretty cute too. 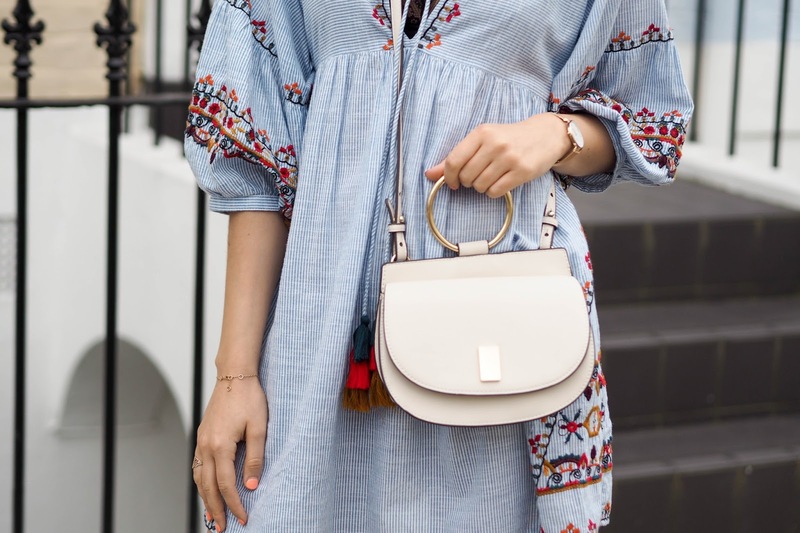 I was always reluctant to buy smock dresses as they can make you look bigger than you actually are but when they are as pretty as this Zara number, how could I possibly resist?! Now as much as I love a pretty, feminine dress I wouldn't be true to myself or my style if I didn't add a badass accessory. For the purpose of today's post I am talking about these amazing Topshop studded sandals. I mean just look at that stud detailing on these bad boys. When I first laid eyes on them I must say I loved the Givenchy vibes, without the hefty price tag of course. I think they add a statement to any outfit and I've enjoyed pairing them with dresses to shorts over the past few days. One thing about this smock dress that I loved so much was the gorgeous embroidered detail. The other was the £29.99 price tag. I 100% thought it would set me back a lot more than that, so a great Zara find if you ask me. Generally, smock dresses are a style that will suit pretty much every body shape. They are also great if you're having a day where you are lacking in body confidence and want to cover up more than usual. We all suffer from the dreaded bloat from time to time so a baggy, comfy dress like this is perfect for those days. I definitely cannot wait to get more wear out of this smock dress this summer, especially if the warm weather continues.